"Mr. Cernikovsky's Friends of Archaeology"
... a private helicopter trip to "Site Q", now called "La Corona"
We are going December 5-6-7, 2013. "Site Q", "La Corona", which, in it's heyday was called Sak Nikte' ("White Flower"), with 36 people. An exclusive trip. All 36 have been filled. You may still be be part of it by joining the waitlist in case someone cancels. We are at it again. At El Mirador in 2011, we were just 20 people interested in exploring faraway Maya sites. At Tak'alik Ab'aj, in 2012, we were now 43 of "Mr Cernikovsky's Friends of Archaeology", as Christa Schieber, the director of that site called us after she and Marion Popenoe Hatch were able to determine, with our donation for radio carbon dating tests, that indeed they discovered the oldest Maya burial in Mesoamerica found to date. This page will give you information about the trip and it will be updated as the plans firm up, with details and the list of people going. This trip will be over three days, with TACA (now AVIANCA) and three helicopters. It costs a bit more than El Mirador, but is a longer trip. A visit to the lab in Guatemala City where some of the best pieces from the dig are kept, and a presentation in an UVG auditorium by the leading archaeologists. Two days in a hotel in Flores with all meals included, and , for everyone, 6 hours at the La Corona site. The thrill of a first class helicopter flight from Helicopters do Guatemala, the best local heli company. It costs $995 per person. The maximum is 36 people, but in that includes the two main archaeologists and the site's director. All 36 seats have already been booked for "Mr Cernikovsky's Friends of Archaeology" third trip. I quite like the name, so let's stick with it for now. The price of the trip again includes a donation to the site and the dig. In this case, they already have a wishlist: a couple of Radio Carbon tests in a Miami lab! They are in the middle of nowhere, about 85 kilometers northwest of Flores, as the crow flies, in the jungle, toward Mexico. A totally unique experience. When we go, there will not be excavations going on ... they bring 85 people to work in April and May, but the jefes y expertos will guide us through the site. It will be done in total luxury, with a nice hotel and meals included ... there is a list below of details. What is Site Q ? Why go there ? What is the plan for the trip ? What does the cost of the trip include ? HASA is arranging our flights and you can use them, too, for your travel needs! Click to visit them to learn of their services. 11:30 - Presentation in a UVG auditorium. "Brown bag lunch". Introduction of the site directors, Tomas Barrientos & Jocelyne Ponce. Tomas is the Director of the UVG Deapartment of Archaeology which marion Hatch Popenoe founded. Jocelyn is an UVG archaeologist who discoverd, in 2012, the decorated stairway at la Corona with the longest Maya text ever found in Mesoamerica. They will be going with us to the site. 13:30 - Visit the UVG La Corona Project Lab, near the UVG campus, where some of the more valuable pieces found at La Corona are being held. 14:30 - one bus leaves for the heliport, with 15 people, the other, with 20, for the Museo de Arqueologia, near the airport. 15:00 - three helicopters leave from Helicopteros de Guatemala, for Flores, E.T.A. 16:45 at the Hotel Maya International heliport. The heliopters stay at the heliport overnight. 15:00 - 20 people visit the Museo de Arqueologia, where the team of La Corona recently donated one of the most valuable pieces found at the site. 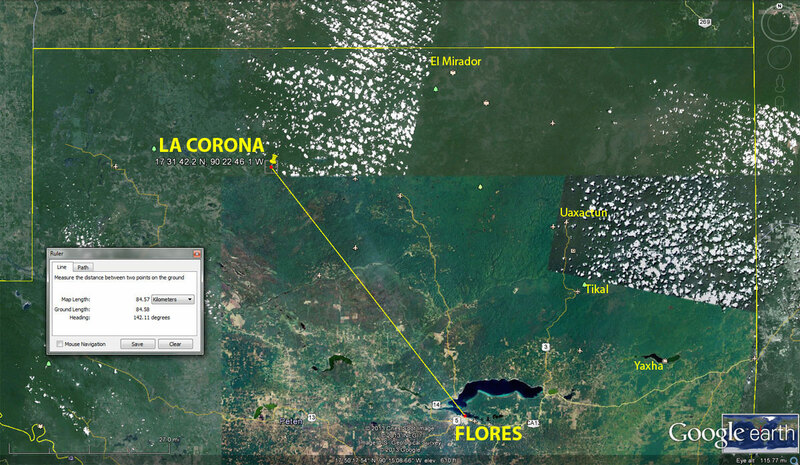 08:00 - three helicopters leave Hotel Maya heliport for La Corona, 85 km northwest, with 18 people and drinks for lunch. The site is at N 17° 31' 42.2" and W 90° 22' 46.1" E.T.A. 08:30 The helicopters return empty to Flores. The first group, if they like, can make a hike to a watchtower some 30 minutes away, which rises above the canopy and return to meet the second group. The second group can make the same hike in the afternoon, while the first group has left for Flores. The archaeologists will have a 4WD vehicle available if someone does not want to walk. 09:45 - we now have 36 people at La Corona. The helicopters stay all day at La Corona heliport. The heliport is about 1,500 meters from the site and 1,000 from the site camp. 13:00 - 14:00 lunch, at the La Corona Camp. 14:00 - 15:00 free time on your own, sightsee, ask questions, relax, have a beer, whatever. People in the second group will now have plenty of time to walk, if they want, to the lookout tower nearby. 15:15 - three helicopters leave la Corona heliport for Maya International with 18 people, E.T.A. 15:45. The helicopters return empty to La Corona. 16:30 - helicopters return with the second group of 18, for Hotel Maya International, E.T.A. 17:00. The helicopters stay at the heliport overnight. 06:30-- transfer to the Mundo Maya airport, near the hotel, for 20 people travelling on TACA 7979 to Guatemala City. Grab a breakfast at the airport. When you get home, you can go on Facebook and post your photos of the trip. La Corona panel, click to see a larger image. What is Site Q ? Why should you join the tour ? First of all, the La Corona site is so remote and inaccessible, that if you don't come with us, you will never again have the opportunity to see it unless someone repeats the recipe on this page and assembles another group to make it an economical proposition. Second, La Corona is rapidly being excavated and more and more fascinating pieces are being discovered. Below are some links to articles of interest. For years, the Site Q was known only from looted archaeological material on sale on the art market, but its location was unknown. In 2005, a team of archaeologists led by Marcelo Canuto, then at Yale, found confirmation of Site Q, during a mission to the norhwest Peten. He was just mapping the site for 5 days. On their last full day, he was setting up a GPS device, but it takes 10-15 minutes to lock onto satellites, so he left it for a walk. He found a trench, dug by robbers, the trench narrowed into a tunnel. At the end of the tunnel, the evidence included an in-situ panel carved with over 140 hieroglyphs that fill in a key 30 year chapter in classic Maya history. Read more on that here. Marcello Canuto, now with Tulane University, divides his life between New Orleans and Antigua. Since 2008, Canuto and Tomas Barrientos, head of the Archaeology Department at the Universidad del Valle de Guatemala, have led excavations at la Corona. 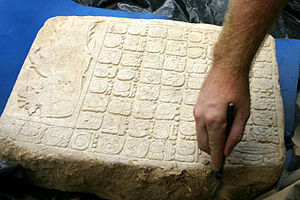 In 2012, they found a 1,300-year-old-year Maya text that provides only the second known reference to the so-called “end date” of the Maya calendar, December 21, 2012. The discovery, one of the most significant hieroglyphic finds in decades, was announced last June. “This text talks about ancient political history rather than prophecy,” says Canuto. What Canuto and Barrientos found was the longest text ever discovered in Guatemala. Carved on staircase steps, it records 200 years of La Corona history ... we are going to see this before our trip to the site and their workshop at the Universidad del Valle de Guatemala. Please read the history in a good Prensa Libre article from August 2012, which quotes Tomas Barrientos throughout. The site rivalled Calakmul and Tikal in its day. Between 300-600 A.D., Period "Ek", the whole main plaza was constructed. In 520 arrived Ix Naah Ek, the first lady of the Ek kingdom, the wife of the king Tuun K'aa' Hix and her daughter married a prince. 600-700 A.D., Period Yuknoom, the golden age of Sak Nikte' ("White flower") as the site was called in its day. The kings of Calakmul wove a network of alliances through much of the Peten and because the rulers on Sak Nikte' were related to them, in this period, there was much construction, especially the group "Las Coronitas", explains Barrientos. The last period, 700-800 A.D., the city grown slows down and it begins to disintegrate. However, even then another important queen arrived from Calakmul. The last date on any construction at the site is 805 A.D. 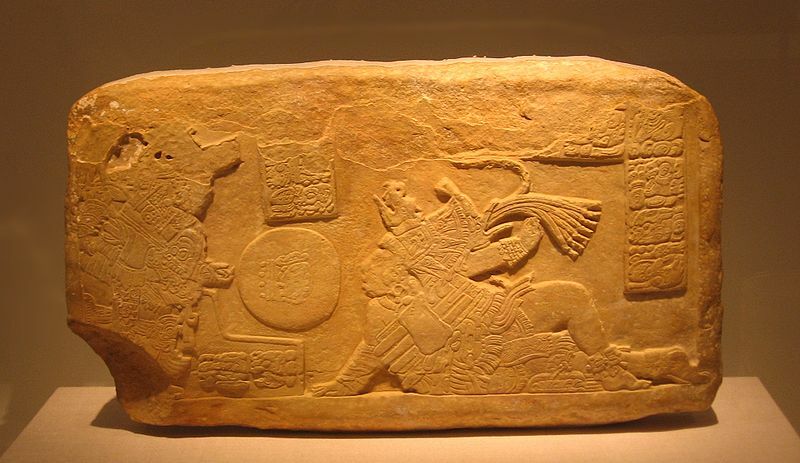 The site consists of 67 structures so far identified, 7 panels, 2 stelas, five altars and seven monuments. La Corona team ... Tomas Barrientos on the left, Marcello Canuto on the right, in the San Nikte' camp. Analy Montenegro, project director, in white shirt, fifth from right in the front row. They will all be travelling with us and will be our guides on December 6, 2013. December 5 - 6 - 7, 2013 ... What does the trip cost and what does it include ? membership in the exclusive elite of "Mr.Cernikovsky's Friends of Archaeology"
The "Site Q Travel Agency" is not in this for a profit. This is a service for friends. 50% deposit was paid in May. In May, I already paid for all the TACA tickets (they booked us 21 seats on planes that usually sell out) and a $5,000 deposit to the helicopter company. Please note that I must know your weight, even if you gave it to me a couple of years ago for El Mirador. I must finely balance the loads on the helicopters, same as last time. I will not tell anyone, but the helicopter company how much weight each flight is carrying. 50% is due now, late October 2013. 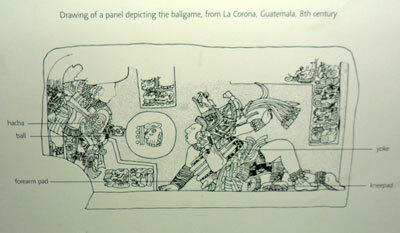 June 2013 ... just spotted among Boston Fine Arts Museum's Maya collection, a ballgame at La Corona. It struck me that many of the fabulous pieces in that collection may be looted, because they do not show sites of origin, just "Guatemala or Belize or Honduras" etc. La Corona staircase riser. Click to see a larger image.